Posted June 29, 2016 by Bailey Heard & filed under Blog, FeaturedOnHomePage. Hi There! Just got back from the Tony Robbins event, Unleash The Power Within (UPW). If you watched the news last week, I know what you might be thinking and the answers are: Yes, I did the firewalk, and NO, I did not burn my feet. 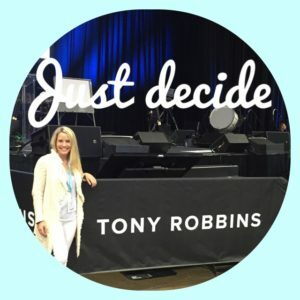 Ever since seeing Tony Robbins on the Oprah Show in the episode where she attended UPW, I knew I would one day experience it for myself! I grew up watching motivational speakers on TV, listening to them in the car, and going to conferences all over the country. From a young age, my parents instilled in me a love for learning and developing myself. At one point when I was younger, however, I believed a limiting story that as a Christian, it was bad to engage in the self-help world. I thought I should only read material or go to conferences from those who claimed to share my faith. Gratefully, my late husband, Andrew, widened my perspective of what it means to be a Christian. I returned to my love of personal development because I realized how beneficial it is to learn from people who come from all different walks of life. I decide, based on my values, which material to apply to my life and which material doesn’t resonate with me. Specifically, the study of human behavior has always fascinated me, so I couldn’t wait to learn more from the leading expert, Tony Robbins, who has studied the topic for the past 36 years. If I had a bucket list, UPW would’ve been on it. It did not disappoint! 50 hours of high energy (lots of dancing to fun music), life-changing content, interactive and engaging activities to apply what we were learning, tons of high fives, and lots of hugs. 8,000 people attended UPW and yet Tony made the experience so personal, as if he was talking directly to me. At the beginning of the event, I was stiff, tense, and a little skeptical. By the end, I was dancing freely with my hands in the air like I did not care. It was an incredible experience I would highly recommend if you are feeling stuck in a specific area of your life and wanting a breakthrough. Here are a few gold nuggets I captured from the event I hope will encourage and motivate you this week! The way you move determines how you feel. Wherever focus goes energy flows. Raise the standards you have for your life. Information is potential power. Action creates power. Our two primary fears as people are: we are not enough and we won’t be loved. The only thing keeping you from getting what you want is the story you tell yourself. Don’t pull back from fear, engage it and take it where you want it to go. What if life was never happening to you, it was always happening for you? Would love to hear which gold nugget resonates with you the most and what it means to you! Please share in the blog comments or Facebook comments. I’m doing an experiment this week and would love for you to join if you feel compelled. Pick ONE thing you normally do everyday and change it up and do it differently for a week. After one week, if you like the results, keep going! Last night, I read six books to my daughter, Ellie, before bed instead of watching Despicable Me for the 101th time. She resisted it at first and specifically freaked out when I turned the lights out after reading. She’s used to falling asleep watching TV, however I want to reduce the amount of stimulation we receive before bed, so I’m attempting to take TV, computers, phones, iPads, etc. out of our nightly routine in hopes of creating a new habit. I’m hoping this new habit will lead to a more peaceful evening and a better night’s rest. Feel free to share with me what you did differently and how it went. I will be sure to update you about how our routine change is going in next Wednesday’s blog! Thanks for hanging out with me today! Grateful for YOU and for your time! Love and Blessings. PS – If you’re looking to motivate, inspire, and encourage a group you are a part of, I would love to come share my message of how each and every one of us can transform our most challenging times into the most meaningful and purposeful path for our lives. Email me at bailey@baileyheard.com. Thanks for sharing this really honest and comprehensive review. I’ve been umming and ahhing about whether to attend UPW especially with the really high ticket prices but I’ve just swallowed and gone for it! I’ll be attending next April and I’m hoping to find it as inspirational as you have! thanks again for sharing! Hi Tony! My pleasure. Enjoy UPW! Blessings.